I have this Transcend Storage Jet external HDD. I was using it with my desktop Win 10 which supported USB 2.0. The transfer rate was satisfactory over 15MB/s. 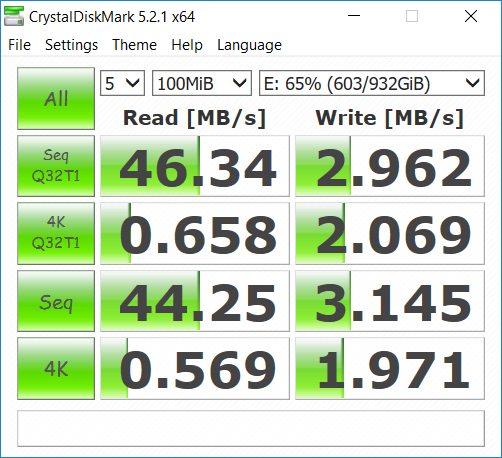 However, when I tried it on my new Lenovo ideapad 510 which supports USB 3.0 and using its USB 3.0 port, the transfer rate is going at a few 100 KB/s. I've tried the following methods. My old PC also does quick removal and there was no transfer problem. However, using TeraCopy, the speed can achieve 32MB/s with the USB 2 port on my laptop. But this is just avoiding the problem, not actually solving it. Actually, the result is exactly the same using Explorer to copy. Browse other questions tagged windows-10 hard-drive usb file-transfer or ask your own question. Where is the internal DVD/CD-ROM drive with USB connector (not SATA)?